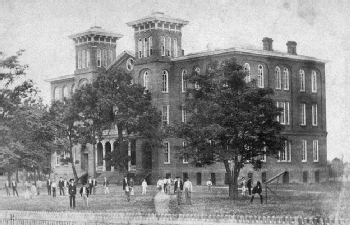 On the site of what is now Samford Hall stood the Main Building at the Agricultural and Mechanical College of Alabama. The Main Building, constructed in 1856 for $85,000, served as the heart of the small college for its first 25 years. The building was an impressive symbol of progress for East Alabama and its four stories and three million bricks were, according to the Montgomery Weekly Advertiser, "one of the finest edifices in the State." The history of the school that is now Auburn University was fundamentally altered in the early morning hours of June 24, 1887 when a fire tore through the Main Building. Shouts of "fire!" rang through the streets of the small town as local residents flocked to the site of the disaster to salvage whatever they could from the burning structure. A number of local men made their way to the second floor of the building where the College's first library collection was located. In order to save the costly volumes, they gathered books in their arms and threw them out the windows of the building onto the lawn below where local women were waiting to move them further from harm's way. Construction of a new building was approved by the State Legislature on the site of what was Old Main. Three years after the fire, a new main building was opened at the College and stands to this day as William J. Samford Hall. The Library was moved to Samford Hall upon its opening and operated in the facility until a permanent facility dedicated solely to the Library was opened in 1909. The Library has changed a lot since the defenestration of the A&M College's books in 1887, but the support of the Auburn Library has remained a constant. We invite you to join the Old Main Giving Society in order to continue to support the students, faculty and alumni who utilize the Library, the intellectual heart and soul of Auburn University. The Old Main Giving Society is split into three levels of generosity. Each level is named after an Auburn University President who presided over a period of growth in the Auburn University Libraries. Charles Thach was Auburn University's fourth President, serving from 1902-1919. As University President, Thach oversaw the funding and construction of the Auburn University Libraries very own building. Then called the Carnegie Library, it was built with a grant from Andrew Carnegie and opened Jan. 11, 1909, at a cost of $30,000 and with a capacity for 60,000 volumes. The Charles C. Thach Giving Level is reserved for young Auburn University alumni (those who have graduated during or after May 2002) or any current or former Auburn University Library Student Worker who pledges at least $500 in unrestricted funds per year. Ralph Brown Draughon was Auburn’s eleventh President, serving from 1947-1965. Draughon received both his Bachelor’s (1922) and Master’s (1929) degrees from Alabama Polytechnic Institute. Under President Draughon, the Auburn University Library moved from Carnegie Library to a new 172,000 square foot facility. The new facility allowed for all campus library resources to be stored under one roof and had capacity for one million volumes and furnished seating for 1,200. The Ralph Brown Draughon Giving Level is reserved for donors who pledge $1,000 per year in unrestricted funds. Donors in this level receive electronic recognition of a laptop sponsorship for one year. James E. Martin served as Auburn’s fourteenth President from 1982-1994. Under President Martin’s tutelage, the Ralph Brown Draughon Library underwent significant expansion. The $20.5 million expansion, at that time the largest construction project ever undertaken in Auburn’s history, doubled the size of the building to 380,000 square feet and increased the capacity of the building to 2.5 million volumes. After the expansion, the Association of Research Libraries invited Auburn University to become their 120th member. The James E. Martin Giving Society is reserved for donors who pledge at least $2,500 per year in unrestricted giving. Donors in this level receive electronic recognition of a group study room sponsorship for one year, an invitation to a special reception with the Dean and a VIP tour of the Library’s Special Collections and Archives. Advance opportunity to receive parking for home football games.